Adventure Park is the place to go when you want some waterside fun. There are plenty of waterslides, kids rides or family activities like go-karting or mini-golf. Start off with the Wild West Canyon, where the water slide takes you through a dark tunnel and you perform two 360 degree spins before moving onto the Aqua Racer, where you can speed down to the finish line at up to 40km per hour! Next up is the Gold Rush Rapids where you'll get flipped, slipped and spun down 110 metres of water slides awesomeness. If all this sounds a bit too exciting for you then ease yourself onto the Lazy River where you simply sit back in an inflatable ring and idly float down the tropically themed river. For the thrillseekers (or the foolish) there is the Tornado which opened in late 2017. 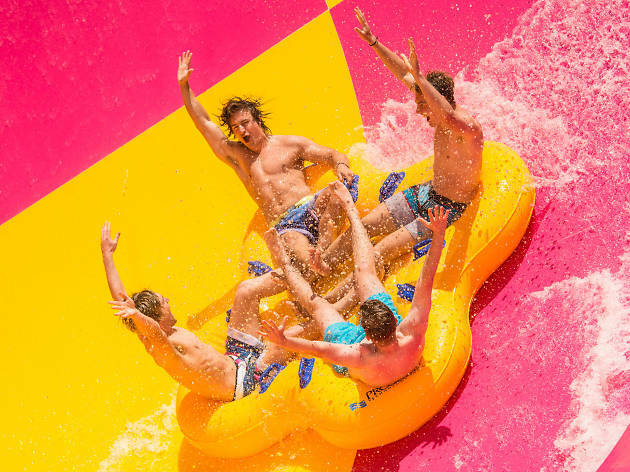 The biggest and longest waterslide of its kind in the state, this beast will drop you down from the 24-metre tower through the snaking slides. You'll even experience moments of zero gravity weightlessness!